3 resealable and reusable Sandwich Bags. Freezer safe, microwave safe, food safe & BPA free.18.5cm x 17cm. Multix products are available at leading supermarkets. Ranging may vary from store to store so please contact your local store directly to confirm that the product you are looking for is available. 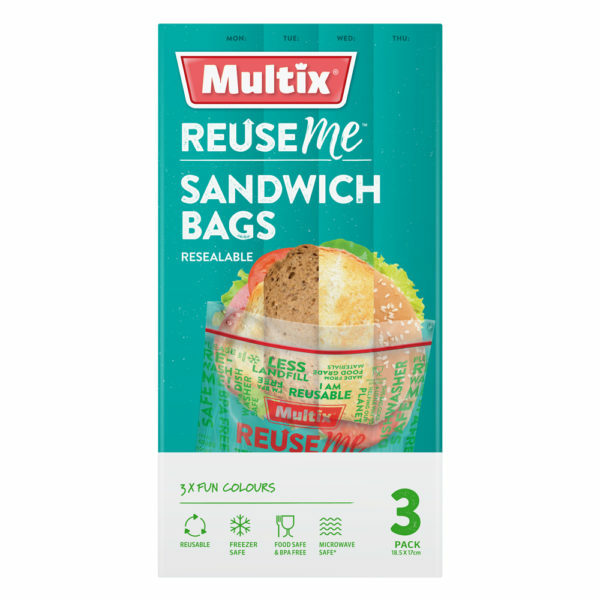 Say goodbye to the days of running out of sandwich bags with Multix ReuseMe™ resealable Sandwich Bags, just pop them into the dishwasher and they’re ready to go again. ReuseMe™ Sandwich Bags are freezer safe, microwave safe, food safe & BPA free. Wash & Care instructions: Top shelf dishwasher safe or hand wash with soap and water, air dry thoroughly before reusing or storing. Microwave instruction: Allow steam to escape when microwaving in bag. To avoid suffocation, keep bags out of reach of children.